Need to determine what downpayment, rates, and term suit you best on your car loan? Use Car Loan Calculator to make the best decison possible. Quick variable inputs allow you to calculate a variety of outcomes until you get the best car payment schedule! No more stress when considering buying a car with the Car Loan Calculator! Have you ever experienced buying a car and then you get yourself stressed because of the computation later on of the payments due on the car? Did you ever miss a car payment date because you were unaware of it? Would it be nice if you could have something to help you keep track of your auto loan instead? Perhaps you could try our Car Loan Calculator. The Auto Loan Calculator is software designed to help car buyers in the computation of their monthly car payments and the date it is due. It is very convenient software for the buyer to use because of its automatic computation of the amount due each month aside from the computation of the whole car loan. The car payment calculator is very convenient to use. It is very user friendly because all the user has to do is to input the values in the blank spaces. The form of the calculator is really so simple and it delivers quick computations. The values like the total value of the car, the down payment, the trade-in value, the sales tax, the interest and the terms in months can be simply entered in the left side of the screen. 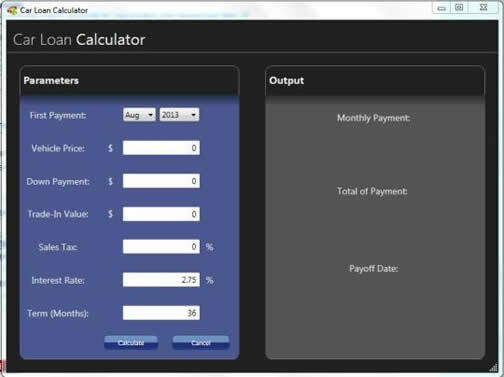 After entering the required value, the loan calculator automatically computes the monthly payment, the total of payment and the pay-off date. The latter is reflected at the right side of the car loan calculator. We have designed the car loan calculator for people from all walks of life. The software design is very simple and we also used a warm color in order that it can easily be read. Our idea behind the simplicity is that, it is better for software to be simple but useful than to have some intricate details which are unnecessary and be absolutely useless. Young and old people alike can easily learn how to do the computation themselves. The font style and the font size are just right. They can be easily read by all users. They will never have to worry that they will come up with a wrong answer. The software has been carefully developed by our programmers in order to ensure that the auto loan calculator shall give nothing but the accurate results. Now car buyers have a great tool in their hands to use whenever they would like to personally keep track of their car loan. They simply access the car payment calculator and they can compute it easily. They can prepare the money ahead of time because the due date will also be reflected in the auto loan calculator. You will never again result to a guessing game. You will have that peace of mind in driving your car. You will never have to worry about missed payments again, or being shocked of the amount due. So what are you waiting for, now download the software now and start managing your car payment right.